A team of Langley men spoiled a celebration in Colorado Saturday night. 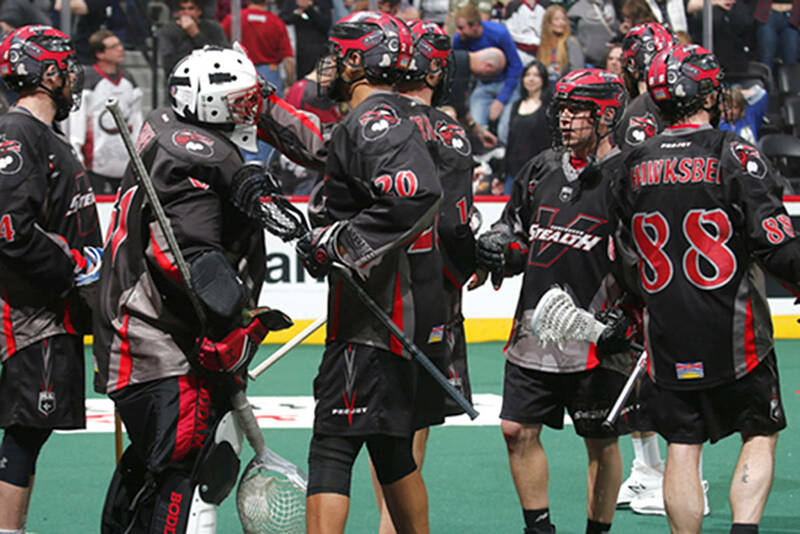 Members of the Vancouver Stealth went into Denver to do their best to disrupt the Mammoth’s John Grant Jr Night, and they accomplished that feat with a 13-12 victory over the fellow National Lacrosse League (NLL) team. As one of the great players in NLL history, Grant stood as he watched his number 24 raise to the rafters. Vancouver looked to gain from the momentum of a very emotional pre-game ceremony in their favour. Stealth’s Rhys Duch helped set up Corey Small for the game’s opening goal 39 seconds into the first, which sparked the Stealth to a 4-0 lead, in the first seven minutes of the game. Colorado went on a six-goal run before Vancouver fought back to make it 7-7 at the half. The teams traded goals in the third to finish it 9-9. Duch gave the Stealth the lead early in the fourth before the Mammoth looked to put the game out of reach with three quick goals to go ahead of the Stealth 12-10. Tony Malcom and Joel McCready had other ideas, scoring two goals in 32 seconds. The game stayed tied 12-12 until Pat Saunders scored on a bouncer with less than two minutes to go in the fourth to secure the 13-12 victory. “It was a battle of a game, it was a big one, a great game for the fans and I got the lucky bounce to score the game winner,” said Saunders. Eric Penney continued his hot hand stopping 39 shots, Tony Malcom scored his career high 18th goal of the season in a two-goal, three-assist effort, Saunders had two goals, two assists and the game winning goal, rookie Casey Jackson appeared in his second game of the season scoring 2 goals and 1 assist, Small and Duch combined for two goals and seven assists, Travis Cornwall had a pair of goals, and Brandon Clelland and Andrew Suitor had the other markers for Vancouver. “We are two teams that are battling hard and we both need a win, it is going to be a good game next week,” said Jamie Batley, the Stealth’s head coach and assistant general manager. “Our guys know that we have turned a corner the last four games and we are excited to comeback home and I am calling on our fans to pack Langley Events Centre next week,” Batley added. The Vancouver Stealth will close their regular season with three straight games at home and then their final meeting of the year in Georgia. The next home game will take place on Saturday, March 31 inside Langley Events Centre against the Calgary Roughnecks for country night. The Stealth are currently hosting an online competition with Stampede Tack & Western Wear, fans are encouraged to go on social media and explain why they should be the winners of a pair of Blundstone boots, two tickets Country Night and a pair of passes to the Cloverdale Rodeo. Tickets to the next home game are available at StealthLAX.com.